Scotland’s Bruce Mouat scored three in the 10th end to beat Canada 8-6 on Thursday, but Koe said that result will have no impact on his team’s preparation for today’s rematch. “I don’t think we do much different. We played well … I took a chance for two that just missed … so we just have to tidy a few things up. We have a good idea of the ice, we have hammer, the rocks will be fine so we’re in good shape. As was often the case this week, Koe, third B.J. 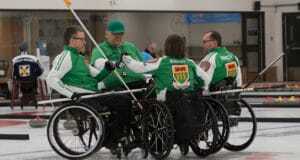 Neufeld, second Colton Flasch, lead Ben Hebert, alternate Ted Appelman, team coach John Dunn and national coach Jeff Stoughton had their hands full, this time with the Netherlands. The Netherlands foursome matched Canada well through six ends, down 4-3 until Canada got one in seven and a steal in eight. 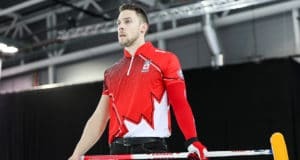 A last-rock draw facing four Canadian counters by vice-skip Wouter Gösgens throwing fourth stones came up just short of being shot rock..
Canada finished the round robin at 9-3, the same as Yuta Matsumura of Japan and Peter de Cruz of Switzerland. The Swiss, who beat Qiang Zou of China (2-10) 6-4 Friday evening, got second place based on the best pre-game draw shots through the round robin. In a game to decide the final playoff team, Scotland (8-4) perfectly executed a tight double take-out to score three in the eighth end to beat Joel Retornaz of Italy (7-5) in a winner-take-all game 9-5. John Shuster of the United States (8-4), with a playoff berth already secured, scored an 8-4 win over Magnus Ramsfjell of Norway (2-10). Defending champion Niklas Edin of Sweden finished atop the standings at 11-1 followed by Switzerland, Canada and Japan at 9-3, the United States and Scotland at 8-4. Sweden and Switzerland advance to the semifinals. The U.S. will play Japan in the other qualification game. The 2019 Pioneer Hi-Bred World Men’s Curling Championship continues with qualification games Saturday at 9 a.m., and semifinals at 2 p.m. and 7 p.m. (all times MT). Sweden will play the lowest-ranked winner from the qualification games at 2 p.m., with Japan taking on the other winner at 7 p.m. The semifinal winners will play for gold Sunday at 5 p.m.; the losers will play for bronze Sunday at noon.